The Marvel universe expands yet again and heads into horror territory as we meet Venom, a lethal protector. 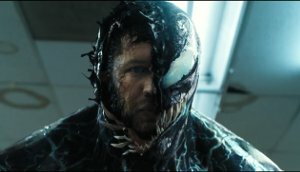 Plot details are scant at the moment, but we follow Eddie Brock who acquires the powers of a symbiote, and has to release his alter-ego “Venom” to save his life. This film is releasing in 2D, 3D, 3D IMAX and 4DX. This is the 2D version. I need a better orthodontist. Language The film contains fairly frequent moderate impact instances of crude language within the context of swearing, insults and derogatory contexts, and to express emotions like frustration, exasperation and shock. Violence There are frequent scenes of violence, intertwined with horror and having a strong cumulative impact, accentuated by cinematic format and cinematographic techniques. Characters perform and suffer acts resulting in physical and psychological harm. Comments Contains scenes of horror. 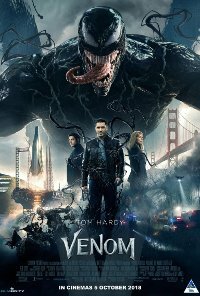 The action horror science fiction film “Venom” explores themes of supernatural powers, rivalry, unethical scientific experimentation, imminent alien invasion, threats to humanity, survival, investigations, relationships, contamination, possession and infection by alien organisms, and intrapersonal conflict between good and bad aspects within oneself. Themes dealing with scientific experimentation, unethical practices, and infection and possession by alien organisms presented in a science fiction context, are complex and mature and may be confusing to cognitively immature viewers. Themes revolving around alien infections which present as possessions, threats by the ruthless Drake to all of humanity, and uncontrolled possessions by aggressive murderous aliens, are laced with dark, emotional undertones and a sustained sense of psychological threat and menace, as illustrated by Eddies distress revealed in his confession to Annie that he is frightened and does not understand what is happening to him. The sense of threat and menace is accentuated by cinematic format (including the dark cinema and enhanced audio-visual effects) in combination with cinematographic techniques such as low frequency sound, dark lighting, dramatic music and sudden loud noises. Themes and the presentation are therefore likely to be confusing, disturbing, distressing, upsetting and potentially psychologically harmful to cognitively and emotionally immature children under 16 years, who may even suffer from after-effects like nightmares. The sustained violence in the presentation of themes may also result in moral harm through desensitisation to violence and the potential effects thereof to morally immature viewers under 16 years who are highly susceptible to influences by the media, especially by sympathetic characters like Eddie (as enabled by Venom to resort to violent acts to achieve their goals). Children under 16 years may not yet have the cognitive ability to comprehend and take into account comedic elements (in the form of dark, sardonic humour), and the unrealistic scenario involving alien infestation and possession while assimilating messages conveyed by the film.